- Stylish and classic design, exquisiteappearance. - 7L High capacity: Store yourwallet, phones, towels, small tools etc. - Suitable for a variety of bicycles andoutdoor cycling. [ High Quality ] - Made of high-end polyester and waterproofing zipper is easy to clean and durable. [ Multiple Functions ] - Fashion design and convenient to carry. Velcro strap is easy to installation and release. You can also use it as a regular bag/ shoulderbag with the strap. [ Large Capacity- 7L ] - you can store your wallet, phones, towels, small tools, outdoor products, water bottles, maps, food, etc. [ Reflective Tape - Safer ] - Both sides of the bags have reflective tape, safer riding at night. With a tail light buckle, you can hang a taillight on the bag when in darkness. 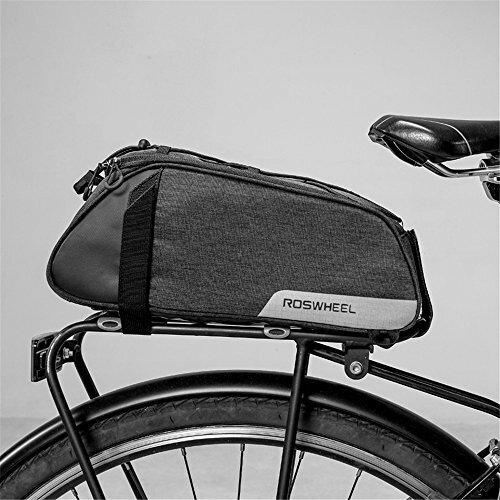 [ Bike Bag ] - Roswheel has designed bicycle bags for various bicycles for many years, such as road bike, mountain bike, etc.The bags are professionally designed, the materials of the bags are high quality and durable, and the styles are fashionable. Welcom to purchase Roswheel bike bag. If you have any questions about this product by AUSTY, contact us by completing and submitting the form below. If you are looking for a specif part number, please include it with your message.